The Mozilla Festival on Media, Freedom, and the Web (Nov 4-6, hashtag #mozfest) was three days in London of "less yack, more hack" focused on journalism and media technologies. The attendees brought together a great convergence of organizations that care about journalism, media, social good, education, open platforms, and web technologies. The weekend held a rich schedule of design challenges, learning labs, and fireside chats, offering everyone opportunities to meet, plan, make, and reflect on media and the web. The overall conference theme centered on protecting and nourishing a read/write web. During the final event, speakers emphasized the importance of supporting technology and cultures that people around the world can use to make content, tools, and games, rather than simply consume them. There was a general sense that beautiful but confined “walled gardens” and closed technologies diminish the open web–and, by extension, innovation. To preserve the open spirit and capabilities that flourish on the Internet, we must protect the ability to do things like view source code, remix content, and more generally learn how to make. During the festival, the Mozilla and Knight Foundations announced the 2011/12 Knight Mozilla News Technology Fellows, including the Media Lab's very own Dan Schultz. The Knight Mozilla fellowships form an exciting open innovation initiative: fellows will be embedded software developers at Al Jazeera, the BBC, The Boston Globe, the Guardian, and Zeit Online. As they make technologies for their own news outlets, the fellows will also collaborate with each other to develop open-source technologies to advance the future of news. Matt Stempeck and I went to the festival to collect ideas for an exciting new project at the Center for Civic Media: technology to track your media diet. Led by our director Ethan Zuckerman, this project will track the content that media organizations and bloggers publish over time, as well as allow consumers to set goals for their own media consumption (Ethan spoke about this at the Lab's fall 2011 meeting). At the Mozilla Festival, we asked journalists, film-makers, and developers to draw their media diet, and held a design discussion about nutritional labels for the news. 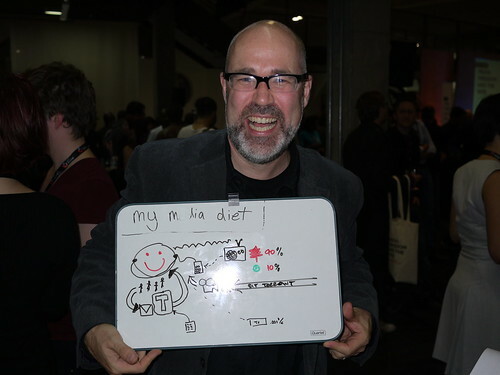 I love the smiley face on Mozilla Foundation executive director Mark Surman's media diet. Mark also taught me a new word to use when praising others: lovebombs. 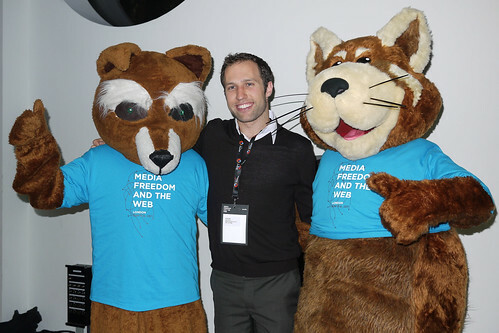 Example: "Major lovebombs to Michelle Thorne, Mozilla and Knight for a great conference!" My favorite part of the Festival was the Hive London Popup for Teens, a series of sessions bringing together youth education organizations from across America and Europe. Instead of just talking with each other, we learned from each other by teaching young people in the same open space. I brought along Aago, a Center for Civic Media project for youth media production. I also had a lovely time introducing young people to Scratch. Before joining the Media Lab this year, I helped found a creative writing center in London, so it was fun to work with London teenagers once more! Overall I had a wonderful time at the Mozilla Festival. We met some great civic organizations, hacking and yacking with a fascinating range of people. The Knight Foundation funds the Center for Civic Media, and I really enjoyed meeting people within the Knight-Mozilla circle. The UK was my home for 5 years until I left London in July to join the Media Lab. I admit I felt wistful as I walked the streets I love so well. But surrounded by my new Media Lab colleagues, in the company of the exciting innovators at the Mozilla Festival, I am excited and inspired about what we can do together for media, freedom, and the web. "Civic Media Goes to London, Part One"
"Putting Voldemort into the Guardian: Remixing the News with Hackasaurus"
"Designing a Nutritional Label for the News at the Mozilla Festival"
"Discussion with Bilal Randeree on Liveblogging at Al Jazeera"
"Ethan Zuckerman Wants You To Eat Your News Vegetables"
"How Social Guilt can Change Our Media Habits or Just Make Us Lie About Them"
"Lessons from the Mozilla Festival: How the Knight and Mozilla Foundations are Thinking about Open Source"
Mozilla Knight News Tech Fellow Laurian Gridinoc: "Visualising my News Diet"
Nathan Matias: "Technology Tent, Occupy London"
Open Knowledge Foundation: "Hacks and Hackers Gather to Write the First Data Journalism Handbook"
J. Nathan Matias is a first-year graduate student researching media consumption, creative learning, and community co-design at the Center for Civic Media. Matt Stempeck is a first-year graduate student researching political identity and how people change their minds, at the Center for Civic Media. Dan Schultz is a second-year graduate student in the Information Ecology group and the Center for Civic Media, researching tools to help people consume information more carefully. Thanks again to my co-host César Hidalgo and everyone who helped organize and participated in the Fall Media Lab event Networks Understanding Networks—my first meeting. I was very inspired by the energy and the sense of community and I hope you felt the same. While we’re still energized from the experience and great interactions, we’re already thinking about how to make improvements for next spring’s meeting. Please email any thoughts or feedback you might have to meeting-feedback@media.mit.edu. Both César and I agree that one of the most important messages that we imparted in two jam-packed days was the benefit of offering a meeting that is highly participatory and inclusive of all of the participants. We firmly believe that great ideas come from encouraging all attendees to talk to lots of different people about topics of greatest interest to them and their organizations. We hope that the meetings are both the source of great new ideas as well as a way to share our ideas. We will continue to look for new and engaging formats to maximize these opportunities. For this meeting we focused on unconferences and research open houses. We’ll be refining these for next year, as well as adding new formats for interaction. And as part of the Lab’s new focus on openness, for the first time we offered all the meeting’s presentations to the world by live streaming them on the web in real time. 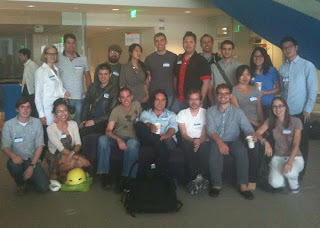 These are archived and available for viewing (http://www.media.mit.edu/events/fall11/networks). Take a look and listen, (http://www.media.mit.edu/events/fall11/networks), and let us know what you think. This is a slide that I got from Cesar Hidalgo. He used this slide to explain a concept that I think is key to the way we think about how the Media Lab is evolving. 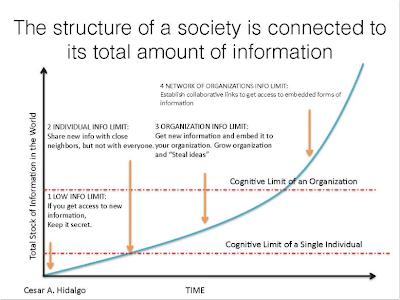 The vertical axis of this slide represents the total stock of information in the world. The horizontal axis represents time. In the early days, life was simple. We did important things like make spears and arrowheads. The amount of knowledge needed to make these items, however, was small enough that a single person could master their production. There was no need for a large division of labor and new knowledge was extremely precious. If you got new knowledge, you did not want to share it. After all, in a world where most knowledge can fit in someone's head, stealing ideas is easy, and appropriating the value of the ideas you generate is hard. At some point, however, the amount of knowledge required to make things began to exceed the cognitive limit of a single human being. Things could only be done in teams, and sharing information among team members was required to build these complex items. Organizations were born as our social skills began to compensate for our limited cognitive skills. Society, however, kept on accruing more and more knowledge, and the cognitive limit of organizations, just like that of the spearmaker, was ultimately reached. When the Media Lab was founded 25 years ago, many products were still single-company products and most, if not all, of the intellectual property was contained in a single company. Today, however, most products are combinations of knowledge and intellectual property that resides in different organizations. Our world is less and less about the single pieces of intellectual property and more and more about the networks that help connect these pieces. 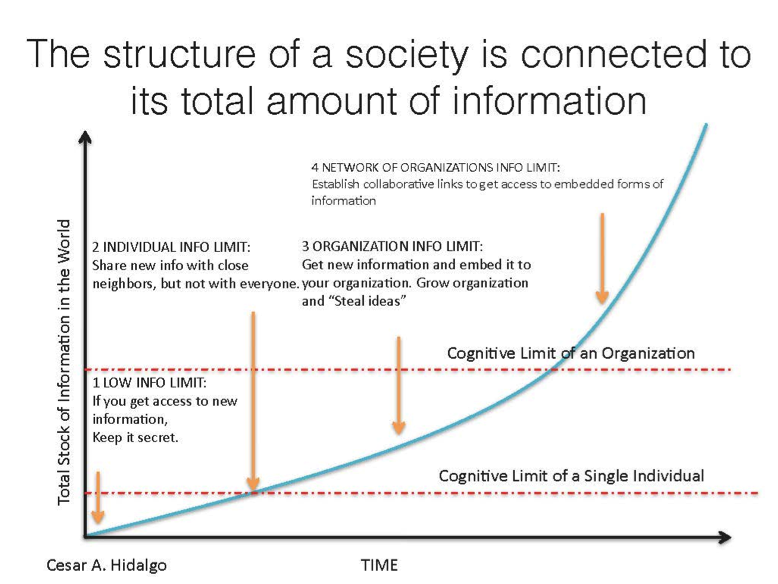 The total stock of information used in these ecosystems exceeds the capacity of single organizations because doubling the size of huge organizations does not double the capacity of that organization to hold knowledge and put it into productive use. In a world in which implementing the next generation of ideas will increasingly require pulling resources from different organizations, barriers to collaboration will be a crucial constraint limiting the development of firms. Agility, context, and a strong network are becoming the survival traits where assets, control, and power used to rule. John Seely Brown refers to this as the "Power of Pull." The Media Lab and its members need to adapt to this world by focusing on creating a platform that can help all of us navigate this new landscape. Together, we are more likely to find niches in the complex and dynamic industrial ecosystem of the 20th century. Openness and engagement will be key in this journey.